She doesn’t need sparkles, she just needs a finish line. If you had asked me about gender roles and differences before I had kids, I would have told you they were entirely the result of societal pressures and enforced norms. But now that I am the proud owner of two little girls, I realize, more than ever, that there is a big difference in the way boys and girls are wired. They play differently, socialize differently and often act differently. But while boys and girls are indeed different, there is one place where they are the same: the world of sports. The way they play them, the way they learn them, the way they love them. Sure, women’s soccer looks a bit different from men’s soccer, but the main difference is simply that there are men on the field in one example, and women on the field in the other example. This isn’t to say that society doesn’t have an influence on gender. I’ve become more aware (and frankly, enraged) about how society perpetuates these gender differences, especially as it relates to sport. Recently, a series of photos of a girls’ softball team has been exploding all over the Internet. In the photos, the juxtaposition of the girls in Princess Elsa dresses wearing eye-black on the infield dirt has made a lot of people smile. The problem isn’t the dresses themselves. In fact, in another context, those dresses are great and fun and even empowering. But when you add them to a softball game, it makes it all about appearance and less about the game and the experience. Sports are not about LOOKING a certain way. Sports are about DOING. About PLAYING. About SPORTSMANSHIP and TEAMWORK. We don’t need to make sports “pretty” or “girly” or “feminine” to “help” women enjoy them. The power of sports goes beyond that. We all rally behind a team because it makes us feel like something bigger. We participate in sports long beyond our peak athletic years because it still makes us feel strong and capable. And these things are universal and genderless. So this year, when yet again, I saw that my Hyde Park Blast race shirt had a different design (in pink, no less) than my husband’s, I felt angry, stereotyped and offended. I’m sure no one meant to disrespect me (or the scores of other disappointed women runners) with these shirts, but, nonetheless, that is how I felt. And the Blast is certainly not alone in its unintentional sexism. We’ve written time and time and time again on this blog about the struggle to empower female athletes, and unfortunately, that balance has not yet been found. Ignoring the inherent differences in the genders does each a disservice, but we need to find a better way to welcome both men and women into the sporting arena. Yes, it is possible to be feminine and strong. Yes, it is possible to love dresses and softball. Yes, it is possible to love the color pink and the way it feels to run a race. However, making sport about these differences also does the sports themselves a disservice. Rather than get our daughters excited to wear an Elsa dress for a photoshoot or a tutu to run a 5K, why don’t we teach them to love the game? To love to run? To explore their physical limits in an empowering way that works the same way for men? 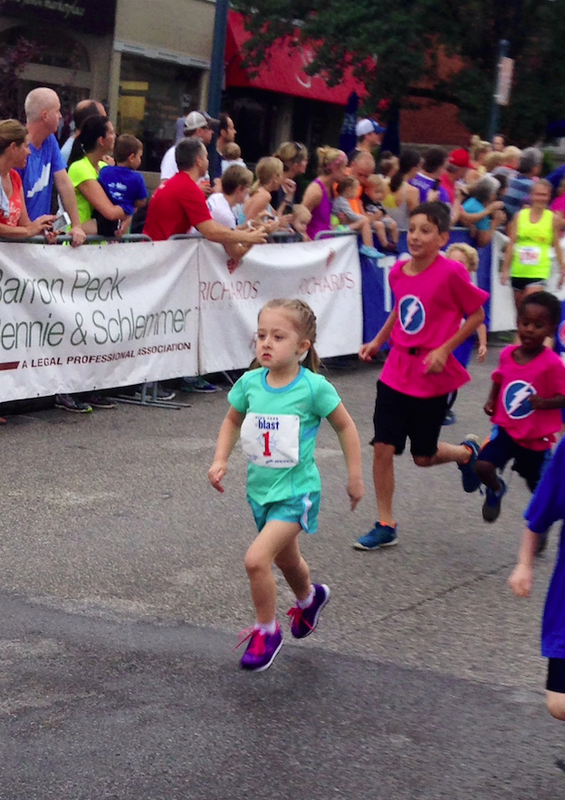 I dream of a world where my daughters can line up for a race and be treated like equals to their male counterparts. A place where they can run on the riverfront without fear of catcalls. A time when they can turn on the TV on any given day and see strong female athletes competing in and talking about the sports they love. We’ve come a long way in our acceptance of female athletes. Shoot, when my mom played high school basketball, it had a completely different set of rules than the men’s game. And when I ran my first track meet, I did so in a pair of men’s spikes because women’s spikes did not yet exist. But we’ve still got a long ways to go. Things are better. The fact that people are making attempts to find ways to get women excited about sports is encouraging, but often, they’re missing the mark. Women and girls don’t need different colored shirts, tutus at their races or sparkles at their softball games. They simply need enthusiasm, encouragement and acceptance in the same way that boys and men learn to love sports.